The circuit demonstrates the use of a transistor as a inverter. The output of an inverter is the opposite of its input. When the input is logical 1, the output is logical 0. 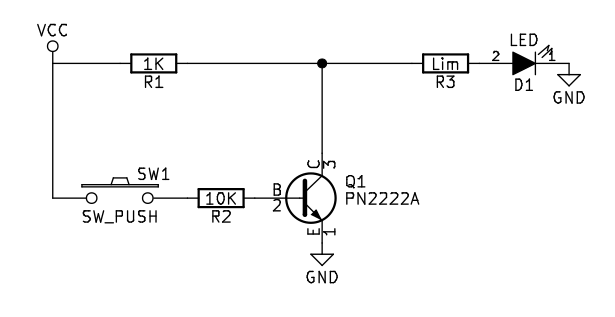 In this example circuit, the input is a push button switch and the output is an LED light. When the switch is open (or off), the LED is on. When the switch is closed (or on), the LED is off. The transistor inverter is implemented here using PN2222A NPN transistor (a variant of the 2N2222A) but many common NPN bipolar junction transistors could be substituted. The inverter circuit presented here is almost identical to the transistor switch circuit with one critical difference. 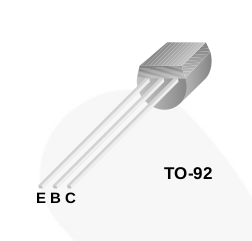 In the transistor switch circuit, the output is taken at a voltage divider between the transistor and ground. In the transistor inverter, the output is taken at a voltage divider between the transistor and the positive voltage. When the push button input is open, the resistance across the collector-emitter junction is very high. The high resistance at the transistor means the voltage at the output is high and therefore the LED is lit. When the switch is closed, resistance across the collector-emitter junction goes very low, and the voltage at the output drops to near zero.